The present church was added to by Sir Richard Assheton, in celebration of the knighthood granted to him by Henry VIII for his part in the Battle of Flodden. The Flodden Window lists the names of the Middleton archers who fought at Flodden Field in 1513. The church also has one of the finest collections of monumental brasses in the area, including the only brass in the UK of an English Civil War officer in full armour, Major-General Sir Ralph Assheton. 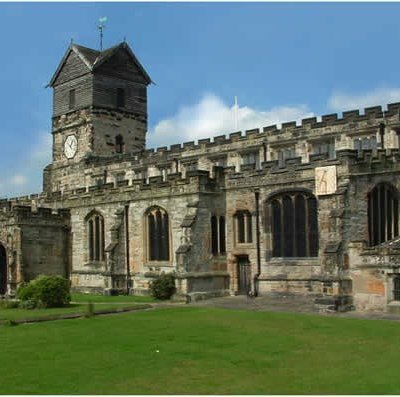 Middleton Parish church is the oldest in the Manchester Diocese and possibly in Lancashire, with a history second to none. St Cuthbert’s mortal remains were carried “to Middleton-juxta-Manchester” c880 and its then Saxon church was dedicated to him. 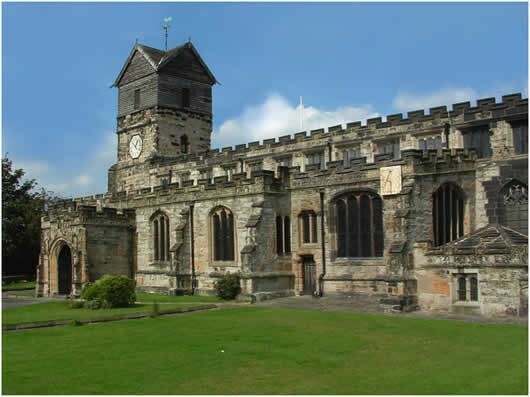 The Norman church of 1100 was dedicated to St Leonard. Columns and carvings from this church were incorporated in the tower arch and in the arch over the pulpit by Cardinal Thomas Langley when he rebuilt the church in 1412. This is the building we predominantly see today. It was extended and heightened in 1524 by Sir Richard Assheton to commemorate the English victory at Flodden. It is mostly untouched by the Victorians so we are left with architecture and fittings spanning 900 years. Admission is free of charge but donations gratefully received. Car parking adjacent to the church. Leave M60 (Manchester orbital) at junction 19, follow signs to Middleton along A6046. Turn right at traffic lights (A664). After about 500 metres turn left into New Lane on your left. If you pass the Olde Boar’s Head on the right, you have just missed the turning! Local railway station at Mills Mill (Leeds to Manchester Victoria via Rochdale), and a very frequent bus service (No 17) from Shudehill Bus Station, a short walk from Victoria Station, Manchester.